Sollo Chenmo (Tib. གསོལ་ལོ་ཆེན་མོ་, Wyl. gsol lo chen mo) — a practice of invocation and offering to Gesar composed between 1877 and 1880 by Mipham Rinpoche. Its full title is 'The Swift Accomplishment of Enlightened Activity Through Invocation and Offering' (Tib. གསོལ་མཆོད་ཕྲིན་ལས་མྱུར་འགྲུབ་, gsol mchod phrin las myur 'grub). 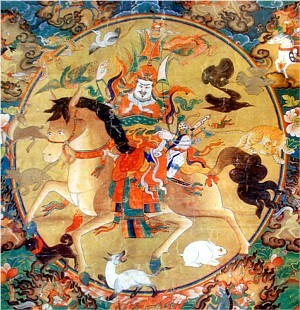 In the practice Gesar is invoked, together with his retinue of dralas and wermas in various forms corresponding to the four kinds of activity and he is requested to carry out his activity and assist the practitioners. Note that the practice should only be recited on important occasions and not too frequently, because it is very powerful. "The practice of Sollo Chenmo was revealed as a gong ter, a ‘treasure of enlightened intent’, by Mipham Rinpoche. According to Dilgo Khyentse Rinpoche all of Mipham Rinpoche’s writings are gong ter. Sollo Chenmo is basically a practice of ‘entrusting activity’. ↑ The term sol (གསོལ་, gsol) in Sollo Chenmo is very difficult to translate into English. When it occurs in practice texts it has at least three separate meanings: to encourage, to offer, and to tell or command. Here, it has the latter meaning in the Tibetan word གསོལ་ཀ་, gsol ka, which is the equivalent of our ‘protectors’ practice’, but here it mainly has the sense of offering. This type of practice is called gsol mchod (translated here as invocation and offering), and it is the best known of all such practices related to Gesar, although the Fifth Dzogchen Rinpoche Thupten Chökyi Dorje (1872-1935) also composed a similar (and even longer) practice. This page was last edited on 23 July 2017, at 18:43.